For more information about the game, visit the Specimen page! I’ve been hinting and teasing, here and on Facebook and on the blog for a few weeks now, but here’s an official announcement: we will be launching a Kickstarter campaign next month to raise money towards the “Specimen” board game. There will be more details as we hammer them out, but we have some cool things planned. The campaign will launch in mid-August and run to the end of September. Watch this space, or this one or this one! This month’s free sound is a one-minute ambience of someone digging during a thunderstorm…is s/he digging for treasure? Burying something? Someone? Digging up a body for some nefarious purpose? Come to burn the bones and dispel a vengeful ghost? That’s up to you; you can get “Digging the Grave” for free at our bandcamp page. This week’s new “Specimen” image: Leena Kurishingal as First Officer Gibson, ready to take on the Specimen with her harpoon gun! Here’s this week’s new “Specimen” image: Eric Neal as Second Officer Palance, complete with his portable tracking device. Introducing another member of the “Specimen” crew: Booth! We’re getting closer to some big announcements! For more information about the game, visit the Specimen page! Here’s the new Specimen image for this week: Carly Joy as Chief Engineer Douglas! For more information, visit the Specimen page! Another fantastic photo from the Specimen game: the mission souvenir portrait from the final(?) voyage of the TCS Brown. 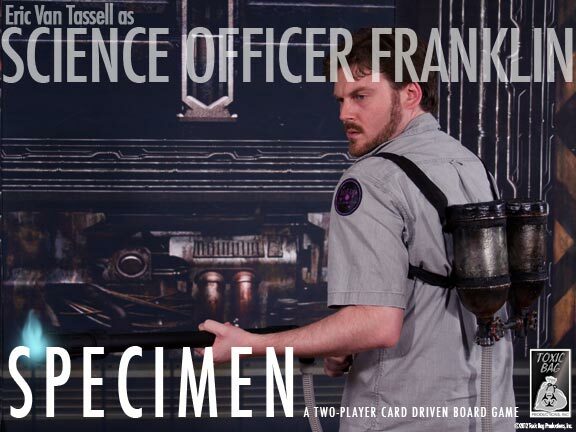 Here’s another awesome new image from the Specimen photo shoot: Eric Van Tassell as Science Officer Franklin, equipped with his trusty natural-gas flamethrower. We’re continuing to take pre-orders for the game, and have some other cool stuff planned which we’ll be announcing soon. For more information, visit the Specimen page!